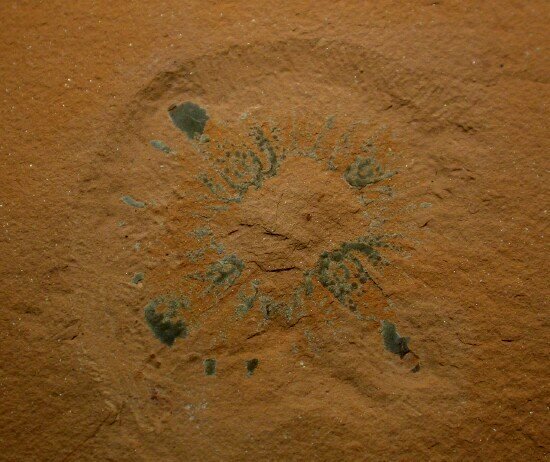 Description: This is the oral disc of the “Terror Of The Cambrian”, Anomalocaris saron, seen here in the first example I have had. The members of this group of enigmatic creatures are known from Asia, Australia, Europe, and North America, and are thought by many to be closely allied with the Arthropda, a position not held by all researchers. 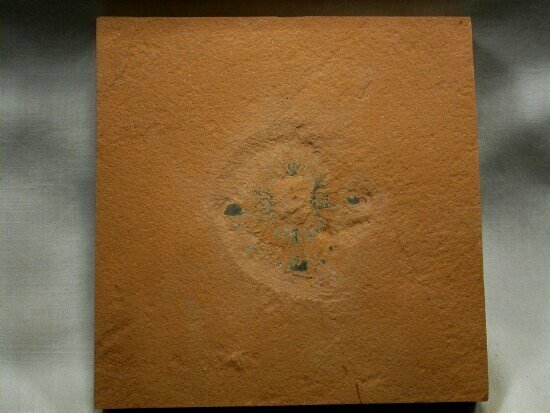 Several have been described from Utah, notably a 50 mm partial specimen of A nathorsti from the Marjum Formation, but they are far more rare than those from Chengjiang or the Burgess Shale. 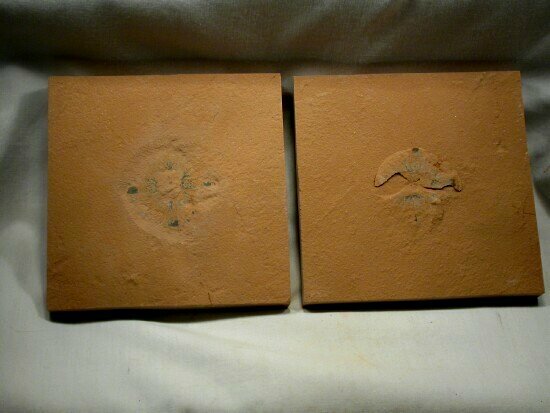 Many examples of Elrathia have been found with bite marks, most typically on the right side, which are thought to have been the result of an abortive attack by this Cambrian raider. 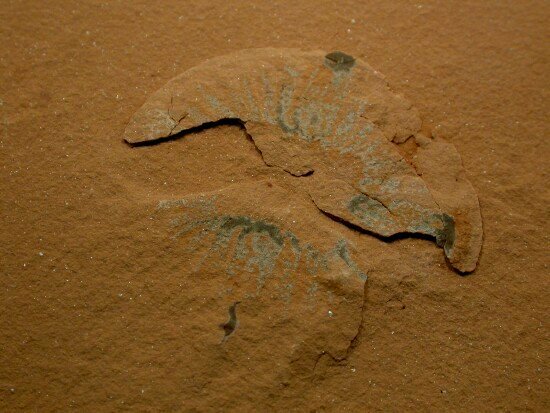 The House Range of Utah has several formations that exhibit Burgess Shale-like preservation of soft tissues, and yield fossils of metazoans asined the same genus as those coming from the Burgess Shale in British Columbia and the older Chengjiang Maotianshan Shales in China. Interestingly, the formations are normally found in alternating biofacies. The Burgess Shale, Chengjiang and various Utah (e.g., House Range) and Nevada Cambrian fossil sites share some commonalities. Some biofacies are rich in trilobites, but poor in soft-bodied animals with mineralized parts, where one next to it is soft body fossil rich and trilobite poor. They also seem to share a common taphonomy, with soft issue perserved as kerogenized carbon films, all the putative result of rapid burial in an anoxic zone without bioturbation, enabling rapid diagenesis (Gaines, 2004). Soft bodied fossils are way more rare in the House Range than in the Burgess Shale and Maotianshan Shales, and when found are not nearly as well preserved. 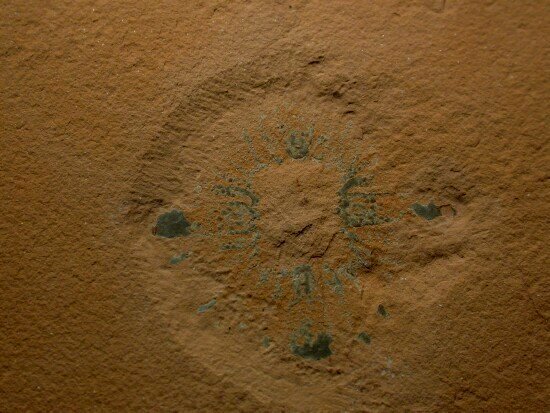 The house range Cambrian Explosion fossils are also exceeding hard to see, even when looking directly at them; often, images are taken of a wetted specimen, which enhances contrast. Some scientists have speculated that the house Range and adjacent vicinities possible house a more diverse assemblage. This is partly because many fossils are problematic and do not seem to fit existing taxonomies and phylogenies. Fossil rarity (other than trilobites), large distances, secluded localities, harsh conditions superimpose to result in meager field work by a handful of hardy souls. If that weren't adequately limited, Federal laws have been recently changed to criminalize collecting, so amateurs must limit collecting to land they lease from the state. In the meantime, the U.S.’s western window to the Cambrian Explosion is heavily, commercially mined and quarried. The Weeks formation has been destroyed by flagstone quarrying of its gorgeous limestone. Untold numbers of scientific marvels are being ground up for road bed fill. Anomalocaris continues well more than a century of being problematic for paleontology. It’s discoverer, Joseph Frederick Whiteaves. In 1892 described an animal resembling a crustacean because its tail reminded of a shrimp or lobster. Walcott discovered a mouth which he interpreted as a jellyfish (Gould, 1989). Description still a work in progress. Briggs D.E.G., and R.A. Robison. 1984. Exceptionally preserved non trilobite arthropods and Anomalocaris from the Middle Cambrian of Utah. 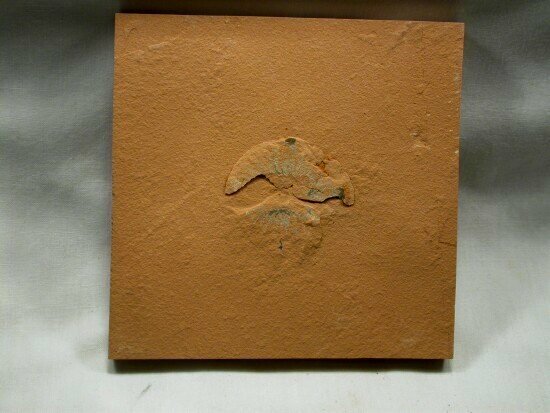 University of Kansas Paleontological Contributions, Paper 111:1-24. Gaines, Robert R.; Kennedy, Martin J. Droser, Mary L. 2004. 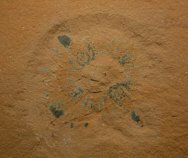 A new hypothesis for organic preservation of Burgess Shale taxa in the middle Cambrian Wheeler Formation, House Range, Utah. Palaeo, 220:193-205. Gould, Stephen Jay (1989). Wonderful life: the Burgess Shale and the nature of history. New York: W.W. Norton. pp. 194–206.